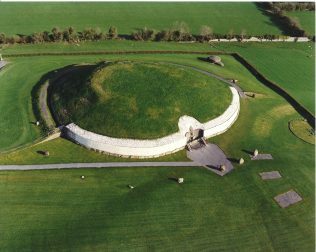 Brú na Bóinne is about 8 km inland from Drogheda and is the name given to an area rich in archaeological remains, which include Newgrange, Knowth and Dowth, situated within a bend in the River Boyne. The passage tombs at Brú na Bóinne were constructed during the Neolithic or New Stone Age and are about 5000 years old. The passage within the tomb at Newgrange points to the south-east and is just less than 19 metres long. It leads to a chamber with three recesses. A corbelled roof covers the chamber. Of the many notable features at Newgrange, certainly the most famous is the small opening, the roof box, situated above the passage entrance. 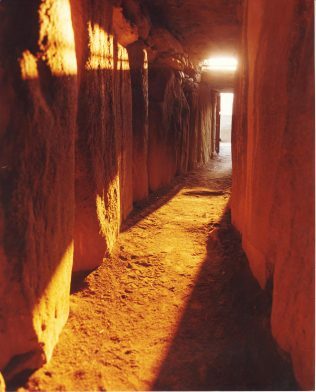 At dawn on the winter solstice, the shortest day of the year (December 21st), and for a number of days before and after, a shaft of sunlight enters the chamber through an opening in the roofbox. The rays first hit the edge of the broken basin stone at the back of the chamber floor and then, as the sun rises higher, the beam broadens and moves down the passage. Modern research suggests that Newgrange is probably the oldest known deliberately aligned structure anywhere in the world. How can I see this unique event? Members of the public can attend the Winter Solstice dawn from 18th, 19th, 20th, 21st, 22nd and 23rd December. As space within the chamber is very limited, approximately 20 people can be accommodated each morning. The spaces are allocated by way of a lottery draw, which takes place at the end of September each year. Members of the public complete and return an official application form. Fifty names are drawn initially and each person is offered two places in the chamber during the solstice period from 18 – 23 December. There are a further fifty names drawn as a reserve list in the event that those drawn out first are unable to attend. The Office of Public Works receives a large amount of applications every year from people the world over who wish to attend this most significant event in the Irish cultural calendar. In 2011, for example, over 31,500 applications were received. These monuments are in State ownership and are managed by The Office of Public Works on behalf of the Minister for Arts, Heritage and the Gaeltacht. National Monuments Division, Office of Public Works, Dún Scéine, Harcourt Lane, Dublin 2, Ireland. Brú na Bóinne Visitor Centre, Donore, Co. Meath, Ireland. Thank you for sharing this information with a wider web audience!